Original part Easy to install just make sure you clean your surface measure and use tape to estimate where you want it to be stuck on. Yes it's a "GENUINE" one and Mopar not a genric one like the others you see or are cheaper. Very nice quality and a "genuine" one from Mopar direct, no imitation here. Great emblem for the Charger or Challenger! Looks great and easy to install with the included foam "frame". Great quality OEM part. It was easy to install and looks great. Dress up your '15-16 Hellcat. Excellent OEM replacement badge. 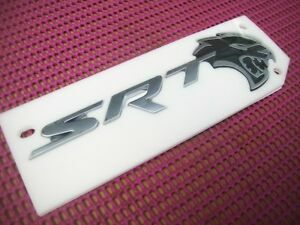 Wanted people to know my '16 Hellcat was more than a standard SRT and this was an excellent way to do that.